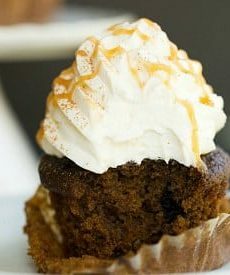 A riff on the popular Starbucks drink.. coffee-infused pumpkin cupcakes brushed with coffee and topped with whipped cream frosting. In a medium bowl, whisk together the flour, espresso powder, baking powder, baking soda, salt, cinnamon, nutmeg and cloves; set aside. Divide the batter between the baking cups, filling each about two-thirds full. Bake until a skewer inserted into the center comes out clean, 18 to 22 minutes. Allow to cool in the pan for 5 to 10 minutes, then remove to a wire rack. While the cupcakes are still warm, brush the tops with the brewed coffee. Let each coat soak in before applying the next. Allow the cupcakes to cool completely before frosting. Assemble the Cupcakes: Pipe the frosting onto the cupcakes, then sprinkle with cinnamon and drizzle with caramel sauce, if desired. Serve immediately, or store in an airtight container in the refrigerator for up to 3 days.